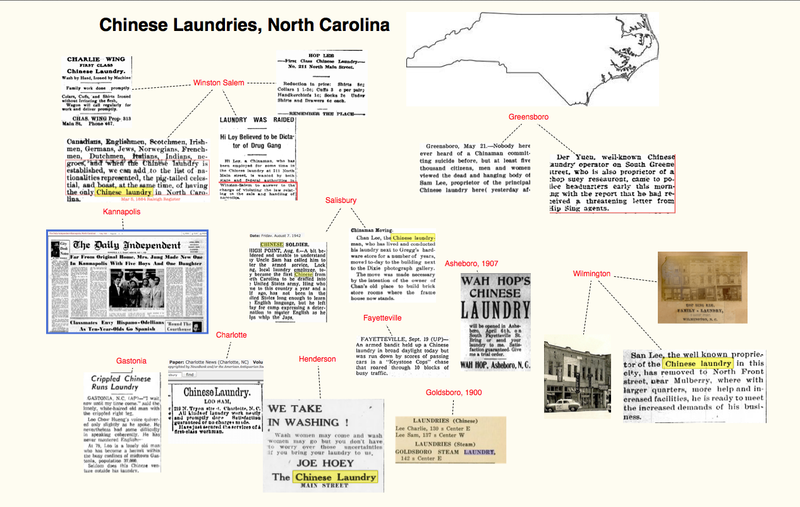 Chinese laundries across the state of North Carolina in the late 19th and early 20th century sometimes received newspaper coverage. Some stories simply reported the opening or relocation of a laundry, while others dealt with human interest accounts of some of the laundrymen and their lives. Some laundries paid for small advertisements of their services and prices in some towns. Other articles covered grim topics such as a suicide, homicide, assault, or robbery as well as gambling or drug and narcotics use and sales. These articles provide evidence of the extent of Chinese laundry presence in this part of the country that is greater than what census records might suggest. For example, in 1900, 37 Chinese were listed in the census, almost all were in laundry work, but usually 4 or 5 men (often listed as sons, cousins, brothers, nephews) worked at a given laundry. Thus, one might expect no more than 10 laundries using this staffing estimate. A 1913 International Business Directory of Chinese businesses listed only two Chinese laundries in North Carolina but that is misleading because a fee was probably required for listings.